We are here to take care of every part of your holiday. We aim to provide a very personal service. We can organise all those skiing essentials for you before you arrive. We want to get you out on the slopes as quickly as possible, by reserving your ski packs in advance this allows you to just that. We will ensure that your discounted liftpasses are delivered to the chalet, ready for your first day’s skiing. We collect payment once you arrive. Book on line now: Update a Booking and Select 'Skipacks'. Reserve your equipment less -35% now to access some great discounts. Our guests choose the local shop for their competitive prices and convenience. Book on line now: Update a Booking and Select 'Skipacks'. All the ski schools are open for bookings now. It’s wise to book in advance to secure the lesson times you prefer. With your Login details (Booking Ref & group leader email) Go to Update a Booking and Select 'Skipacks' and make your booking on line with us. Having your ski packs organized in advance works perfectly for our guests - you can simply relax in to your holiday as soon as you arrive! Leave the chalet with lift pass in hand, equipment ready to go and your lessons booked. We will deliver your liftpasses to the chalet, ready for yoru first day's skiing. In Meribel there is the choice of 2 liftpasses, the Three Valley (3V) liftpass or Meribel Valley (MV). The 3V pass gives you unlimited access to the world’s most amazing ski area with 600km of groomed runs, 44 green runs,129 blue, 108 red, 30 black runs, with 174 lifts. The MV pass is a fantastic ski area & gives you access to 150km of groomed runs, 9 green runs, 34 blue, 23 red, 7 black,with 50 lifts. There are 2 superb and extensive snowboarding parks in the Meribel Valley and 7 in total in the Three Valleys. The price difference between the Meribel Valley and Three Valley pass is 20% and for the small extra cost you get a huge amount of additional skiing, and it allows you complete freedom to discover the whole of the Three Valleys. Go to Update a Booking and Select 'Skipacks'. The family pass is available to 2 parents with 2 children or more, ages 5-17 years inclusive. Every family member pays the child rate. If you purchase a MV pass you can upgrade to a 3V pass, but please bear in mind if you upgrade more than once, it is more cost effective to buy a 3V pass from the outset. MV to 3V extension = 37€ daily. If you have a weeks skiing/boarding experience or more, we would recommend the full 3 valley pass. Meribel/3 Valley operates with a Hands Free Pass, NO PHOTO REQUIRED. We will deliver all your lift passes to your chalet so that you may join the bubble from Les Allues. This will take you directly to La Chaudanne in Meribel, which is where all the main lifts depart from including liaisons for the 3 Valleys. Please pre-book your liftpass and they will be ready for you in your chalet. No need to pay in advance – you can settle up once you get here by cash or credit/debit card. Go to Update a Booking and Select 'Skipacks'. “Ski Higher” our local ski hire shop, is very handy in the village centre, well stocked and with a great choice of equipment to choose from. It is just a few minutes stroll from all of our chalets. British run, with competitive pricing to suit all budgets especially as they offer our guests -35% discount. We have already added the Promo code for you, so the -35% discount has been applied. 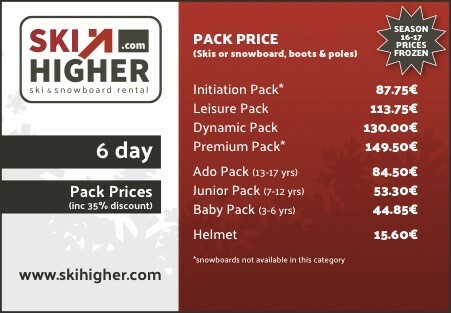 Ski Higher has established itself as having an excellent choice of equipment to suit all abilities from beginner to expert. They also have plenty of children’s equipment and helmets. If you’d rather not complete all the equipment details now, go to Update a Booking and select Ski Packs. Your equipment will be reserved for you, pay in resort and make your choice of equipment level on being fitted out. This local shop has been well supported by Ski Blanc guests over the years and the Ski Higher team pride themselves on really looking after all our guests. If ever you want to try a different level of equipment, or swap from skis to a snowboard, the shop will be happy to change it for you. They stay open late for us on arrival day, so you are ready to set off first thing the next morning. We have done a price comparison and in general you will find the prices cheaper in Les Allues compared with the centre of Meribel. Please let us know if otherwise. This is a guide to the best Ski & Snowboard Schools in Meribel. You have a fantastic choice. Book directly and let them know you are with Ski Blanc for a PRIORITY booking service. View all the products for the 2018-19 season. You can book online or drop them an email. We do urge you to pre-book all lessons as early as possible – this is essential during school holiday periods. Oxygene Ski & Snowboard School (Formerly known as Magic in Meribel) A firm favorite with Ski Blanc guests and comes highly recommended. They have a superb reputation for offering a personalised approach in small friendly groups for adults and children. Group lessons are taught in English and they have the Three Valleys’ most popular children’s ski programme; the Magic Fun Factory lessons perfect for kids aged 4 to 17 and jam-packed with confidence-boosting tips and techniques. Whether you're looking for private, adult, kids, off-piste or snowboarding lessons, Oxygene have it covered. Give them a call today. It is our first choice Ski & Snowboard School so please book early. Now the most popular British School in Meribel, and one of our personal favorites, Parallel Lines Snow Sports School provides the very best ski and snowboard lessons for all abilities with English speaking instructors. From their base in Meribel, and run by people who know Meribel inside out, they have built a top-level team of skiers and specialist snowboards, committed to offering the very highest levels of service from first contact to final turns. They offer a full range of friendly ski and snowboard lessons for adults and children, small group lessons, private lessons, off piste guiding and freestyle. A very personal ski school which comes highly recommended by our guests. Their friendly booking team will be able to help with information and advice. New Generation Ski & Snowboard School. New Generation is a community of snowsports enthusiasts here in Meribel delivering awesome ski lessons, every time. With over 20 years’ experience, they know what makes a good holiday great. They match you with friendly and experienced instructors to help you get the most out of your holiday. They offer a wide variety of lessons for all ages and abilities, from tiny tots to those young at heart. All in English. All with big grins. So whether you're looking for group lessons for the kids, a private refresher session or a clinic to push your skills further, they will help you build confidence, develop technique and have fun. A small team of highly qualified & professional snowboard instructors, providing second-to-none coaching for all snowboarders from beginner to park addict. The ESF is the longest established ski school in the Meribel valley, and have a fantastic range of great value products on offer. From children's and adult group lessons to their highly qualified instructors who can offer the full off piste experience. They offer great flexibility allowing you to book a day here and there, be it a half day child care to a reduced rate private lesson in the lunch hour. A very good way of exploring the Three Valleys and benefiting from some expert tuition or guiding is by taking a private instructor. 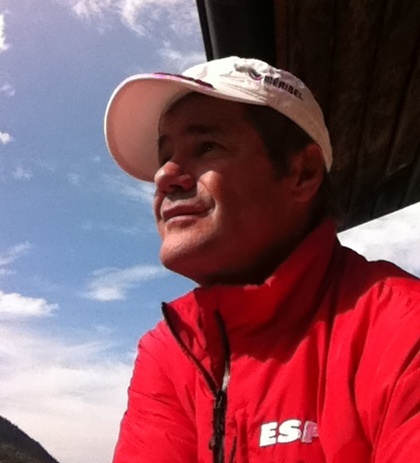 Iain Macluskie is a Scottish ski instructor based in Meribel with many years of teaching experience. A member of the famous Ecole de Ski Francais, he has been in Meribel for over 20 years and knows the 3 Valleys ski area intimately. "My specialty is private teaching or guiding. I can lead on or off piste adventures throughout the Three Valleys with lunch stops to suit your group or family taste. I am available for full or half days for up to six adults or children: 250€ (morning or afternoon), 300€ (4 hours) or 440€ (full day)". Ski & Boot Lockers are located at La Chaudanne, the main lift station. This is where you get off the bubble from Meribel Les Allues. These have a heated boot rack and hold 3 sets of ski equipment. They are both reasonably priced and practical. You can change as soon as you finish skiing and continue your après ski in comfortable shoes. Ski Blanc reserves the ski lockers for all our guests in advance. There is no obligation to take them and we cancel the ones that aren’t used. Parents with 2 small children will be able to squeeze into one. If you do know how many you require, just advise us on our online booking form.